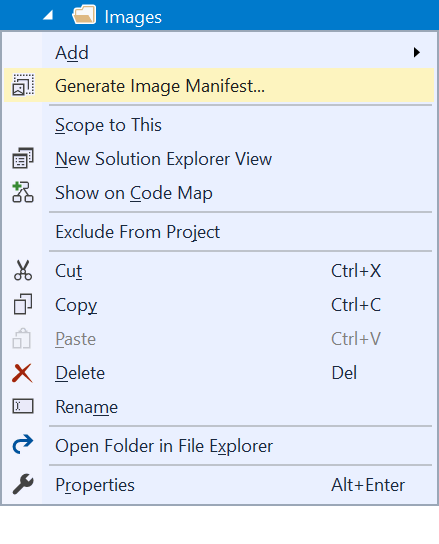 Makes it easier to create and maintain .imagemanifest files for Visual Studio extension. This tool wraps the ManifestFromResources.exe tool into an easy to use command. Right-click any folder and select "Generate Image Manifest...". This will take all .png and .xaml files and add them to an .imagemanifest file. When more image files have been added to the folder, simply repeat the steps and override the .imagemanifest file. This tool will first read the old .imagemanifest file in order to keep the existing IDs.